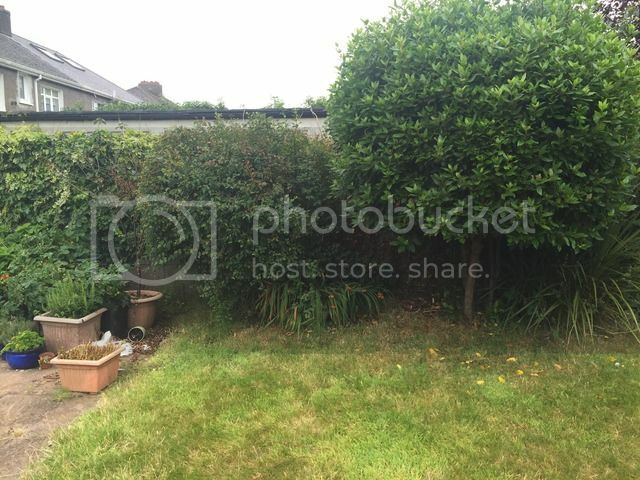 I moved into a new house last year and want to change one of the beds. The photos below show the bed. 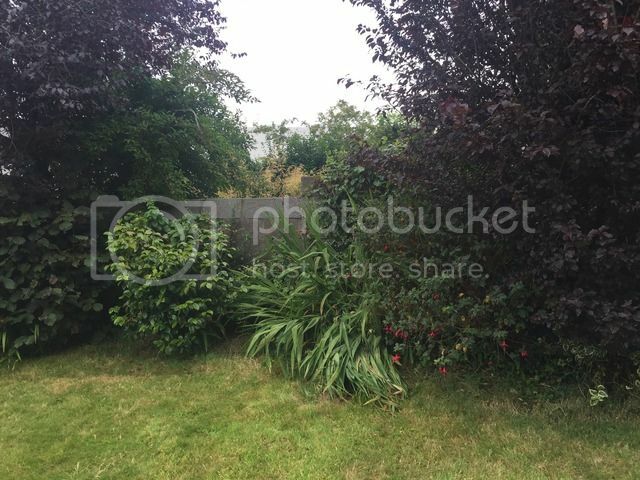 I know nothing about flower beds so am keen to get suggestions. The bed gets full sun (faces directly south). In the "top" of bed photo, the gap between the two trees needs to be screened because the neighbour's bbq area is here and overlooks where we eat outdoors. 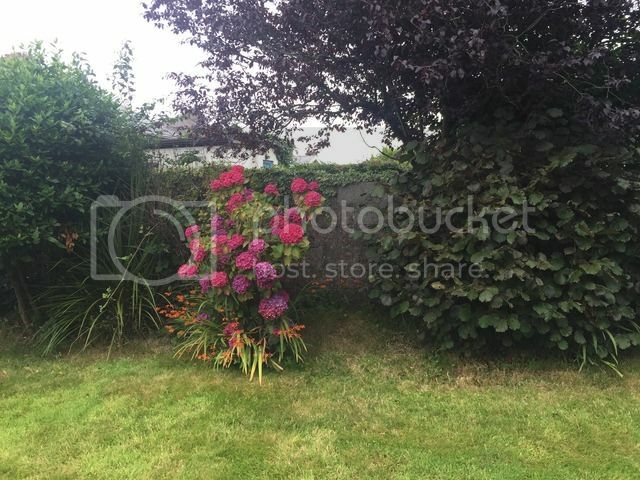 I'll include a few rose bushes and I like flowers with tall flower spikes (foxgloves type flowers. that's weird, photo's show on my phone and pc. Uploaded using photobucket. I can see the pics fine. Unfortunately I don't know know anything about borders because I don't have borders or lawns. Anyway, someone will be along shortly to help. Evening Primrose? Cowslips? London Pride to fill gaps? Ice Plants? I could help with some of them if need be. Plenty in our garden. Thanks Blowin - that's very generous. After googling, I particularly like the London Pride and Cowslips. Always ask why a gardener could help by giving you plants, Maybe they are invasive and they would like you to suffer too. Greengage, how do you spell cynic? They do all multiply but are also easy to thin out. So you agree with my synopsis, you can give him Anenome, Lysmachia, Bugle, Foxgloves and Impatiens Grandiflora lovely plant. never need to visit a Garden centre again. You're welcome, CG. I think I'll gather up a handful of evening primrose seeds and toss them over Greengage's fence as he clearly hasn't mentioned them? 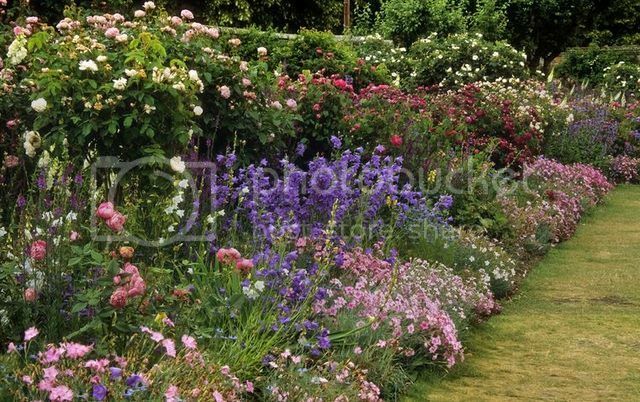 That border with the roses is quite glorious, but methinks you'd need a team of gardeners to keep it looking that good. You say you would like roses? I've tried roses in a mixed border - they looked good for about 3 weeks every year and quite ugly for the rest. The only sort that I would recommend would be something like 'Roseraie de L'Hay'. It looks good even when not in flower and has good autumn colour, large, bright red hips and is very healthy. It grows to about 7', so would need to be at the back of the border. The following are some plants I wouldn't be without. Yes, they can be a bit thuggish, but they are hardy, healthy, low maintenance and really lift my spirits. What more do you want? The cowslip has a beautiful scent and attractive seedheads. The photo of the crocosmia doesn't do it justice. I have it growing with Verbena Bonariensis they really brighten up a rainy afternoon in September! That particular Astilbe has a much longer season than most and lovely autumn colour. I have fresh seeds of the cowslip, if you would like some.